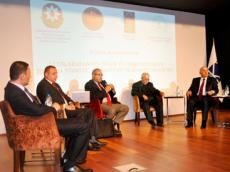 The scientific conference on “Genocide of Azerbaijanis and Karabakh realities” co-organized by Society of Turkish Speaking States Friendship and Cultural Relations and Center for Eurasian Strategic Studies has been held in Istanbul Aydin University. The conference held with the financial support of the Council of State Support to Non-Governmental Organizations under the President of the Republic of Azerbaijan has been opened by the rector of Istanbul Aydin University, Professor Yadigar Izmirli. The chairman of the Society of Turkish speaking States Friendship and Cultural Relations Eldaniz Salmanov gave detailed information about the conference. Participants watched a documentary on the “Genocide of Azerbaijanis.” MP, Professor Musa Qasimli underscored “Groundless claims of Armenian genocide and massacres of Azerbaijanis” in his speech. Former State Minister of Turkey Abdulxalid Chay told about the genocides of Turks in Kars, Van and other areas procreated by Armenians living in the territory of the Ottoman Empire. Speaker also gave detailed information to participants on the number of Azerbaijanis living in West Azerbaijan and their deportation from these lands based on specific facts. The chief of the “Our Generation” Public Association Nuraddin Mehdiyev, the teacher of the Baku State University, Doctor of Philosophy in History Vasif Gafarov and Jandan Azer who was the Ambassador of Turkey in several countries also made speeches. The book “Karabakh: questions and facts” translated to Turkish with the financial support of Youth Assistance Fund and booklets on Armenians’ massacres against Turks prepared with financial support of the Council of State Support to NGOs have been distributed to participants.